- Design : bonspeed® California Speed & Design Studio, Anaheim, Calif.
- Paint : DuPont Match Head Red Applied by L&G Enterprises, San Dimas, Calif.
LAS VEGAS, Nev., November 2, 2004  Jaguar North America is planning to offer its X-TYPE owners a chance to pump-up and show-off a little more muscle. The company teamed-up with leading California speed and design studio, bonspeed®, to create a new range of body styling, suspension and braking equipment for Jaguars all-wheel-drive X-TYPE premium compact sedan. To showcase the range of components that could be available, Jaguar and bonspeed® today unveil a bold, dramatic bonspeed® 3.0 X-TYPE concept at the 2004 SEMA specialty equipment show in Las Vegas. "bonspeed® has done a great job in showing that the X-TYPE has the potential to be a tough, but sophisticated-looking tuner project car," says C.J. ODonnell, Executive Vice President, Marketing, Sales and Communications, Jaguar North America. "And, with a significant number of Jaguar X-TYPEs joining our award-winning Select Edition certified pre-owned program next year, it will be even easier for younger buyers to get into an X-TYPE than ever before," continued O'Donnell. The exterior of the bonspeed® X-TYPE is 'red hot' thanks to a special Match Head Red paint developed for the car by DuPont and applied by L&G Enterprises in San Dimas, Calif. The dramatic, DTM touring car-inspired body package was designed at bonspeeds Anaheim studios and features new front and rear fascias, extended side rockers and an integrated trunk spoiler. The body package gives the car a low, aggressive stance and enhances the car's already- striking lines. To give the Jaguar extra power, bonspeed worked with Superchips Tuning, in Florida to enhance the X-TYPEs engine management system. Together with a new Borla stainless steel, 2.5-inch diameter exhaust, and an XP high-flow intake, the changes deliver an extra 30bhp to the X-TYPEs 3.0-liter AJ-V6, increasing power to around 260bhp. "One of the main goals we set ourselves to achieve was to develop the X-TYPE to accommodate 19-inch wheels," explains bonspeed® president, Brad Fanshaw. Fanshaw and his team worked with suspension specialists Detroit Speed & Engineering to develop a new, slimmer tubular trailing arm rear link. This allows the bonspeed® X-TYPE to be fitted with not only taller 19-inch rims, but wider 255/35-19 Michelin Pilot tires. To give the concept the kind of stopping power to match its extra grip, 13-inch cross-drilled Baer rotors were fitted, clamped by Baer calipers. Front and rear Koni shocks, together with stiffer Eibach springs, give the bonspeed® X-TYPE sharper handling and tighter body control. The concepts new interior is as radical as its exterior. New Recaro F1 race-style bucket seats were added to the front, while the complete cabin was re-trimmed in super-soft crimson leather supplied by luxury leather goods maker, Mulholland Brothers, in San Francisco. 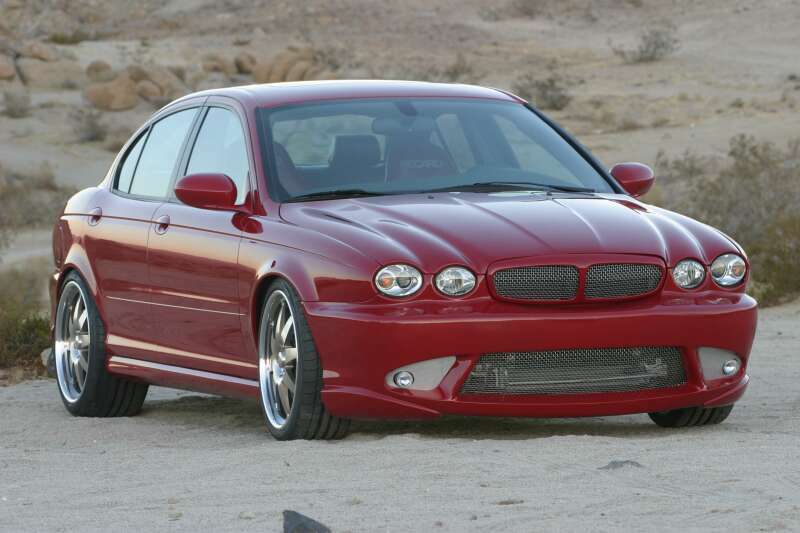 And, carbon fiber accents on the dash and gear surround are shared with the 2005 Jaguar X-TYPE 3.0 Sport. For the cars 1200-watt in-car entertainment system, bonspeed® fitted twin Sony liquid crystal TVs for front and rear passengers, along with a Sony head unit and DVD player. Sound is pumped out through Diamond Audio speakers and amplifiers, all linked together with Metra Electronics cabling. "Our plan is to eventually offer all the features seen in the bonspeed® X-TYPE to X-TYPE owners. 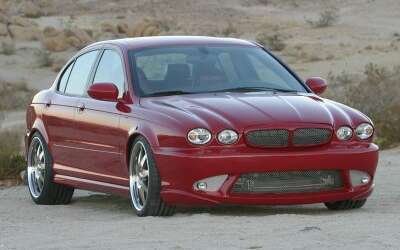 The Jaguar makes a perfect platform for a highly-expressive tuner vehicle for the enthusiast market," explains Fanshaw.